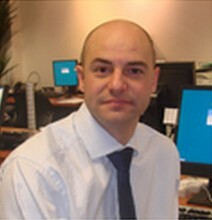 Rupert Bedell, Head of Group Marketing at Moneycorp, says editorials in well-regarded publications are very effective. How frustrating must it be to have a pile of money in plain sight, yet be unable to get your hands on it? That’s the case for many banks and financial services firms when it comes to young expat professionals. They see huge revenue potential, but often fail to get their message across. Rupert Bedell, Head of Group Marketing at Moneycorp, talks to Expat Marketing about the challenges facing financial services firms trying to reach young expat professionals. Rupert, for banks and financial services firms, what distinguishes these young professionals from the typical, 40+ expat? Some people say the young professionals are “poor in time, rich in money.” At Moneycorp we’ve found that they want low touch, efficient services. They certainly don’t want to wait in a line for 25 minutes at a bank branch. We’ve also found young professionals don’t necessarily want a lot of extra information such as market commentary. Many are already working in business and financial services. They know what’s going on in the market. Firms are definitely thinking hard about this target group. Why do they struggle to reach them? One problem is many of them already use comprehensive banking services such as HSBC’s Premier Banking, which works for them anywhere in the world. It’s difficult to entice them away from that. Another is that younger expats are less predictable in their buying behavior and as a result, are more difficult to target. With older expats it’s easier to identify how to reach them: you know what websites they visit and what papers they read. Is it fair to say that for these young expats, social media sites such as Facebook and Twitter could be those communities? Possibly, but a lot of firms feel these sites aren’t friendly toward banks. Twitter is very useful for doing customer research and getting feedback, but most people are less willing to be “friends” with a bank or financial services firm online. Because of that a lot of marketing managers don’t yet see the upside to social media. They only see risks. Do you think that’s a disadvantage in an age where a lot of marketing efforts are moving online? I don’t agree with the attitude that online is the only way to go. For one thing, you don’t always have a lot of control where banner ads are appearing, as with Google Adsense, which can hurt your brand’s credibility. There are also issues with sourcing where your clients are coming from. In financial services few customers come to us after viewing a single ad. When they click on a banner Google or an affiliate gets credit for that. In reality it was probably a number of different factors that caused them to click. At Moneycorp we’ve found making a sustained effort through focused media is very important. Paying for online ads everywhere can be wasteful, particularly if your website bounce rates are high. Have you found the return on investment for online ads is decreasing? Costs to acquire customers are going up and up. There is also intense competition for keywords. Banner ads will work best if accompanied by other media using the same creative. Random banner placement on its own can be ineffective, particularly if your brand isn’t well-known. Is it fair to say online ads don’t build the level of trust banks need? “Trust” is probably the biggest thing a customer looks for in a financial services firm. At Moneycorp, our customers want to know that if a transfer goes trough it’ll be done correctly for them. Otherwise it creates a major headache. It’s not that online ads don’t build trust, but that placement is important. An ad on a trusted media website is generally going to have a lot more credibility than one on a random affiliate website. 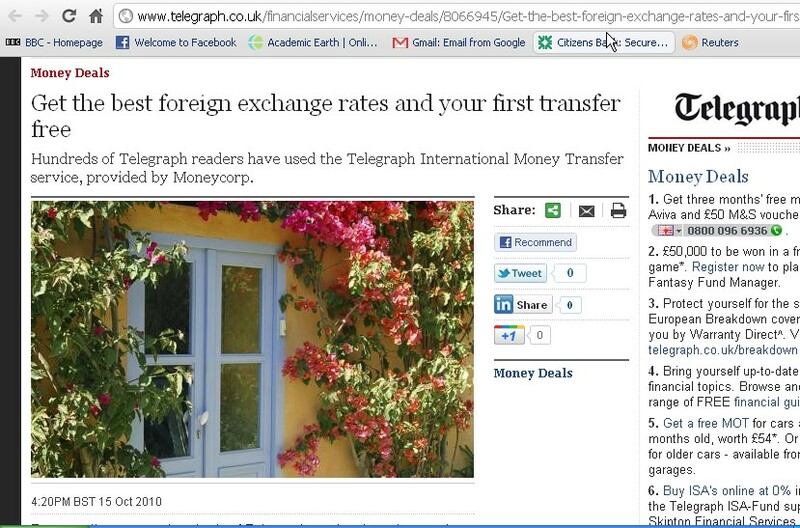 Telegraph editorials have brought considerable traffic to Moneycorp's website; click to enlarge. Can you give an example of a campaign that’s particularly effective for building that trust? We’ve had some success with national newspaper partnerships, where we provide an endorsed service on a long term basis. This means our advertisements repeat regularly to the same audience. It also leads to editorial inclusions, which are very effective—provided your service is very good. 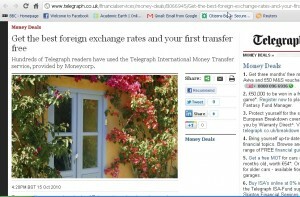 An example of this is the Telegraph Money Transfer service. They’ve also written editorials about international money transfers discussing our services. We’ve seen that efforts like this—even outdoor campaigns—have actually driven more traffic to our website than banner campaigns. How important are differences across language and culture to these campaigns? In terms of expats living in London we have found language less important than culture. When you create a campaign it’s important to steer away from broad cultural stereotypes—such as boomerangs for Australia. To really reach out, you need to show you have a greater understanding of the expats’ culture, and more subtle references can be effective. When they see a clever ad in a tube station and say, “gee, I haven’t seen that since I was a kid,” you know you’ve got their attention at least. So the “traditional” expats want a lot of information, and the young professionals want speed and ease of use. Are banks capable of targeting both young expat professionals and older expats? Or is the gulf between them too wide? I wouldn’t necessarily call it a “gulf.” Again, the challenge for firms is mainly to find out what communities the young professionals associate in and get the targeting right. There is definitely value in this group, but banks haven’t yet found the silver bullet. Posted in Expat Campaigns.Tagged banks marketing expats, expat marketing, financial services marketing, marketing young professionals, online marketing, print marketing, young expat professionals.